You are able to delete the documents you no longer need from your own account at any time. If you are a document owner or have access and document management rights you can also delete a document from other invited participants accounts if they have not sign it yet. 1. Open a document from your document listing page. 2. Click "Delete" button that is located in the action bar at the top of the page. 3. Confirm the action by clicking "Delete" button in the warning window. Note: this document deletion action is permanent and can not be undone later. 4. 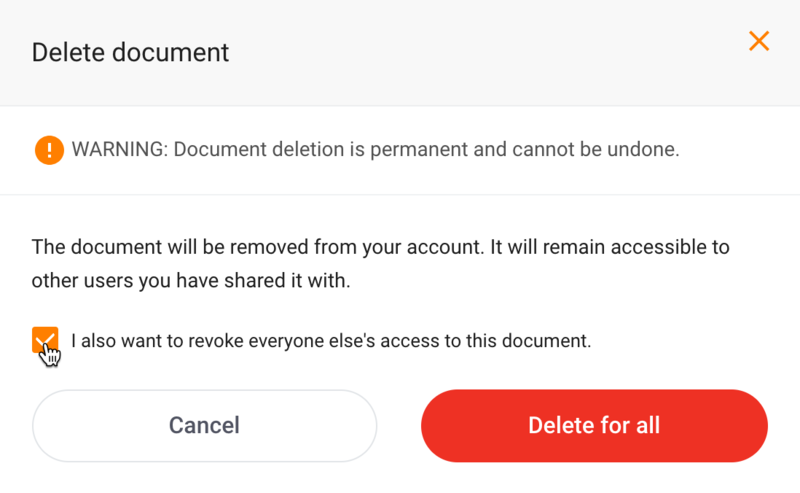 If you want to delete the document not only from your account, but from everyone else's as well, make sure the "I also want to revoke everyone else's access to this document." checkbox is marked. Note: if you do not mark this checkbox, the document will only be deleted from your own account and will still be available to the people it is shared with. This options is only available if the participants have not signed the document yet. If the document is signed, you will not be able to delete it from this person's account. 5. If some of the invited people have already signed the document but you would like to remove the document from the remaining participants who did not sign it yet, click the "…” (ellipsis) and "Remove participant” button next to their name in the no. 3 "Participants” section.